Hagley Museum and Nemours Estate are offering a special holiday discount for visitors to both museums from December 1 to 30, 2018. During December, visitors who show proof of purchase at one museum will get a 50 percent discount at the other. The discount applies to an adult ticket (including seniors), with a limit of two per proof of purchase. The discount is valid for daytime events only and is not valid for special events. At Hagley, this holiday will delight visitors with enchanting exhibitions, a delicious gingerbread house display, a seasonal setting for taking photos in Santa’s Workshop and a day to meet and take photos with Santa. Throughout December, rooms in the duPont Residence will display decorations reminiscent of Christmases past of the du Pont family. New this year is “The Magic of Miniatures,” featuring an 1890s’ dollhouse filled with mohair plush bears. During December, Hagley is open daily 10 a.m. to 4 p.m., except it closes at 2 p.m. on Christmas Eve and is closed Christmas Day. Adult tickets are $15, with seniors $11. For more information on hours and admissions, visit www.hagley.org, or call (302)658-2400. 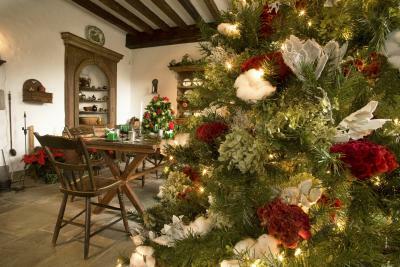 At Nemours Estate, the holidays will be on full display throughout the month of December. 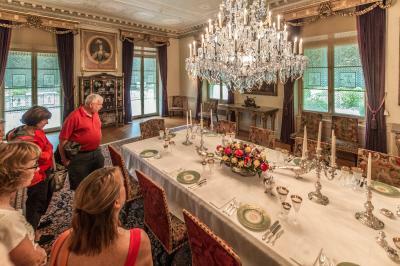 Step into the beautiful splendor that was the home of Alfred and Jessie Ball duPont, whose generosity established the world-renowned Nemours/Alfred I. duPont Hospital for Children. Enjoy Christmas trees, wreaths, and hundreds of feet of garland on grand display in the Visitor Center, Chauffer’s Garage, Mansion and grounds. New this year, the mechanical wing of the Mansion’s basement will feature holiday displays made from metal, glass and industrial elements, which is sure to inspire any inventor or engineer! During the month of December, Nemours Estate is open Tuesday-Saturday, 10 a.m. to 5 p.m., with extended hours until 7 p.m. on Thursdays. Sunday hours are noon to 5 p.m. The Estate is closed on Mondays, and it will also be closed on Christmas Day.